In 1904 the Oakbank Oil Company built the Niddry Castle Oil works at Winchburgh. The works were connected to the shale mines in the area by electric narrow gauge tramway. 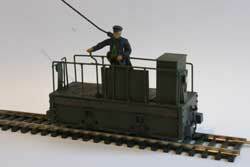 The line was of 2' 6" (760mm) gauge with a traction voltage of 550V DC supplied via tramway type overhead. Contemporary articles show that the whole oil works complex was fully electrified and considered advanced for its time. From the Niddry Castle oil works at Winchburgh the line ran north passing under the B9080 road. After leaving the cutting it ran onto a low embankment, passed under the Dalmeny to Winchburgh railway and through another cutting to the original terminus at the shale mines near Newton. There were two later extensions, a rope hauled section that ran west from a triangular junction at Newton to the mines at White Quarries and a branch from the electrified section to a mine at Totleywells. No3 was a British Thomson Houston Company 100hp unit supplied in 1906, again no cab was fitted. The mechanical portion was built by Bagnalls of Stafford. 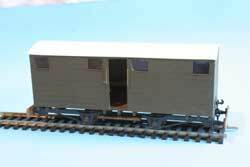 No4 was an English Electric built steeple cab type supplied in 1929. Nos 5 & 6 (left) were built by MetroVick/Andrew Barclay who supplied one in 1942 and one in 1946, it appears they were ordered from Metro-Vick who supplied the electrical equipment, and subcontracted the mechanical side to Barclays. As an industrial railway there were no public passenger services, but the line had three home built coaches for workman's services. 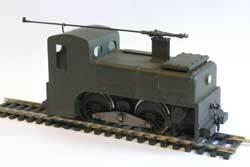 The main part of the stock were small hopper wagons for the shale traffic, each carrying about 30cwt. 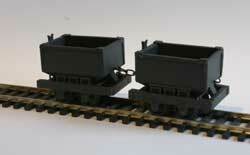 The wagons were loaded at the mines from storage hoppers. After travelling along the railway to the oil works they were taken by rope hauled incline to the top of the retorts where their loads were discharged into storage bunkers ready for use. This was only a small corner of an industry which had been declining for years due to competition from cheap imported oil and in 1961 the line closed, followed shortly afterwards by the whole shale industry. Little remains of the railway, the bridge under the road at Winchburgh, the cutting and embankment as far as the main railway. A further cutting still exists to the north side of the M9 motorway. At White Quarries some of the buildings survive as small workshops. Of the rolling stock a Baldwin locomotive is preserved at the Livingston Farm Heritage Centre, where there is a shale industry museum. The Tallyllyn railway in Wales bought some wagons from the line as ballast hoppers, but these have been rebuilt and no longer bear any resemblance to the Winchburgh wagons..
Less remains of the industry the line served, today only the red bings stand as a reminder of an industry which once dominated the area. The Scottish Shale Oil Industry & Mineral Railways by Harry Knox has a chapter on the railway [Published by Black Dwarf Lightmoor]. Blastpipe (Journal of the Scottish Railway Preservation Society) for Summer 1986 (also published in the 009 society magazine. An article by P.D. Hancock. The Railways Of Scotland Volume Nine: Routes From Stirling. This DVD by Cinerail includes some footage of the railway.